HousingAlerts.com is the only market cycle-timing program on the planet that provides real estate investors with PROVEN, actionable decision triggers covering all U.S. local real estate markets. HousingAlerts utilizes proven Technical Analysis techniques to quickly and accurately measure all components of each market’s cycle; the same methodology employed by sophisticated Wall Street investment banks and global trading firms for trillions of dollars in daily stock, commodity and futures trading. The most important decision for any real estate investor is to first recognize where that particular market is in its cycle; then employ the correct investing strategy for those conditions. This has never been truer than in today’s tumultuous volatile marketplace. For the first time in history, the “average” investor now has access to the same professional-level predictive tools used by the large banks and institutions. HousingAlerts’ is a web-based, state-of-the-art, fully automated local real estate market timing system. It completely removes the guesswork and complexity from the most challenging problem facing today’s real estate investor; should I buy, sell or hold? It’s revolutionizing the way real estate investing is done! You can learn more by attending the (FREE) full length training webinar. The inventor, Mr. Ken Wade, has an M.B.A. from the Harvard Business School, is a C.P.A. and a full-time real estate investor for most of the last three decades with hundreds of multi-state land, residential and commercial acquisition, development and sales deals valued in excess of $100,000,000. 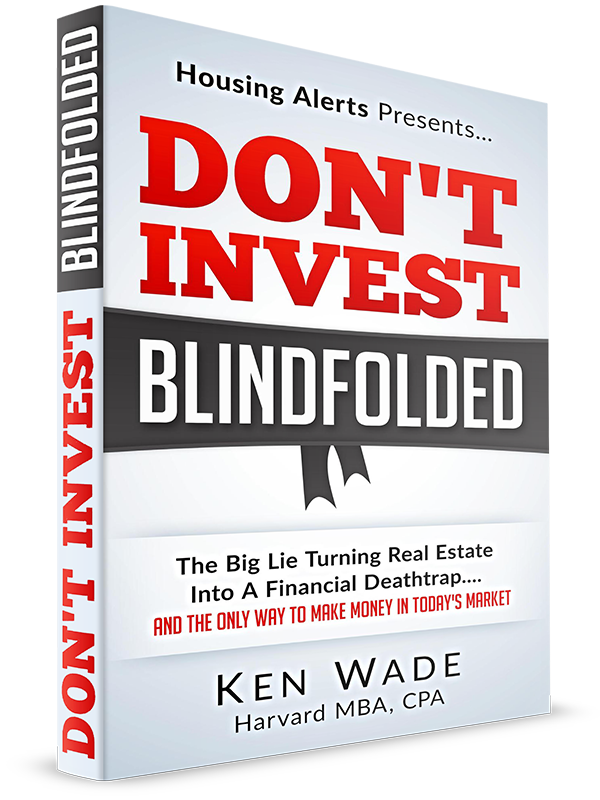 "Don't Invest Blindfolded" is yours FREE! Grab your copy right now.